Gearing up to celebrate its 5th Anniversary the team at Beyond The Valley have kept the surprises coming with the additions of hip hop maverick Joey Bada$$ and the currently on fire Fisher to this year’s already heaving line-up. Renowned for his raw and visceral style, Brooklyn hip hop star Joey Bada$$ continues to maintain a keen and sharpened edge to his music. After storming the hip hop world with his debut mix tape “1999” in 2012, Joey has continued on the rise to worldwide acclaim with a series of essential and vital releases, including his most recent album All-Amerikkkan Bada$$ featured guest spots by ScHoolboy Q, Styles P, J.Cole, and amongst others and hit the top five of the US Billboard album charts, earning hundreds of millions of views on YouTube along the way. LA via the Gold Coast DJ, producer and former pro-surfer Fisher first came to the attention of music lovers via his Brisbane tech house project Cut Snake. After dropping his debut single ‘Ya Kidding’ in 2017 and racking up over 6 million plays on Spotify since, the track was one of last summer’s total party anthems. A collection of equally popular singles has followed, including the fresh banger ‘Losing It’ and now Fisher sits at the very cusp of electronic music greatness, winning fans and supporters across the U.S.A and the world. 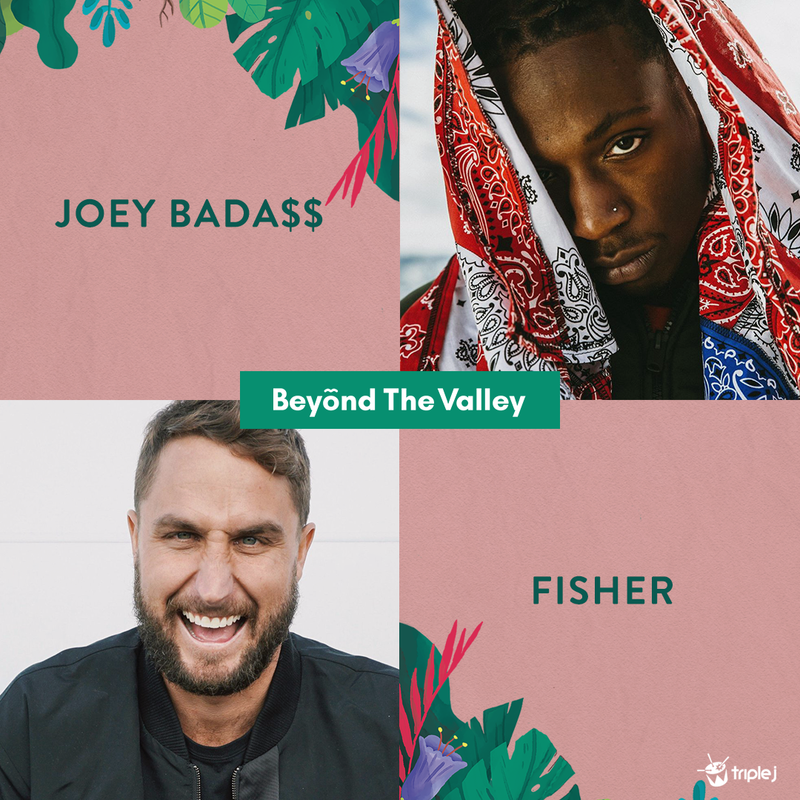 Joey Bada$$ and Fisher join a massive Beyond The Valley line up which includes The Kooks, Tash Sultana, Bonobo, PNAU, and Duke Dumont to name but a few. Taking place from the 28th of December 2018, through to the very early hours of January 1st 2019, Beyond The Valley happens amongst the emerald rolling hills of its permanent home at Lardner Park, Lardner – just 90 mins drive outside Melbourne. Beyond The Valley is the essential destination for cutting edge music lovers and a must for those who love to see in the New Year by indulging in the fine-tuned, high-end glamping experience that the festival has become known for. Keep an eye out for more surprises coming soon! !